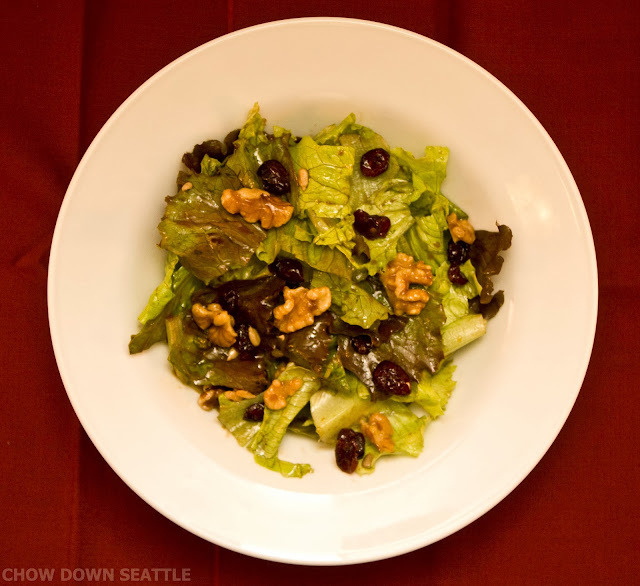 Last month I attended the International Food Blogger Conference (IFBC) here in Seattle. I had a great time and I met a lot of great fellow food bloggers. At the conference, I also met with Oxbow Farm. Oxbow Farm is located in Carnation, WA. Oxbow's mission is to "EDUCATE people on the importance of environmental stewardship and healthy food, to RECONNECT us to the land and our local sustainable food supply, and to INSPIRE us to take action in our daily lives and in our communities." Oxbow offers a CSA (Community Supported Agriculture) program. 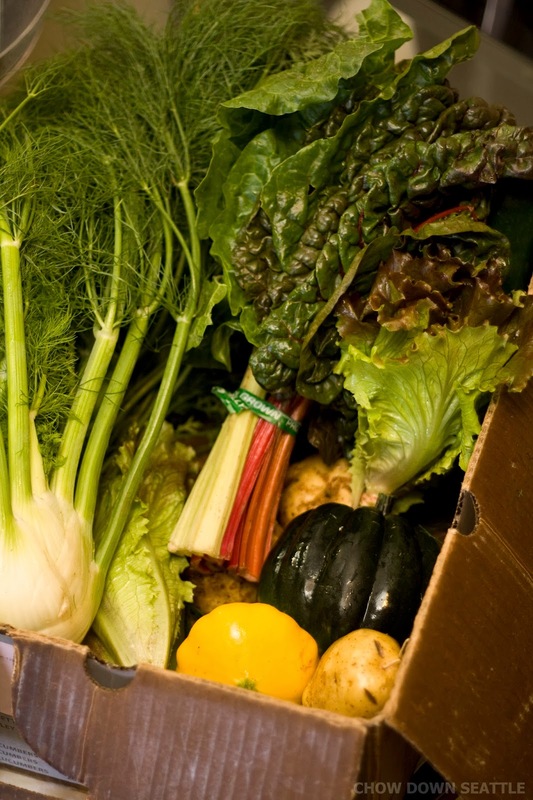 For a fee, you receive a box of delicious, fresh, organic produce delivered weekly straight from the farm! Oxbow Farm had a display at the IFBC to inform bloggers of their program, and to educate us on the local, organic, sustainable food they offer. I signed up for The Oxbow Box Project. By signing up, I received one complimentary box of Oxbow Farm produce. In exchange for the delicious box of produce, I was asked to write a blog post about how I incorporated the produce into my daily dinners. I must admit that I have not personally cooked with some of the contents of the box I received, but I looked at this as a great opportunity for me to become more familiar with some of the local produce, and to broaden my cooking skills. 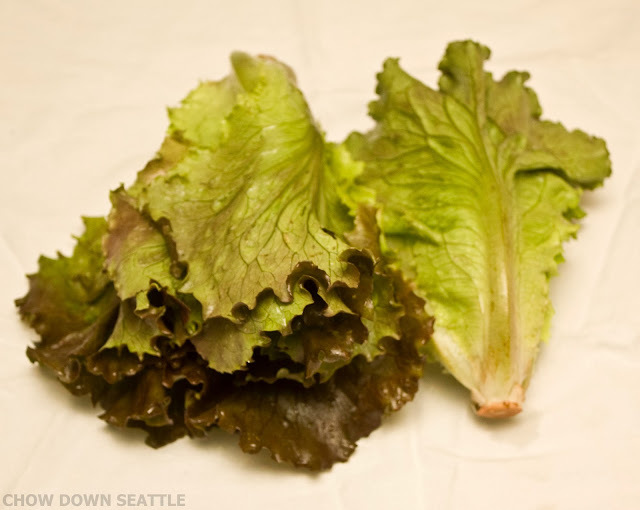 The first thing I made with my produce was a salad with the Oxbow Farm Red Leaf Lettuce. I just added some dried cranberries, walnuts, sunflower seeds, and tossed it with some extra virgin olive oil and balsamic vinegar. It is safe to say that this lettuce tastes much better than any bagged lettuce I have purchased. Fennel is one vegetable that I have not personally worked with before. I do love the taste of Fennel as it has a licorice, or anise flavor. 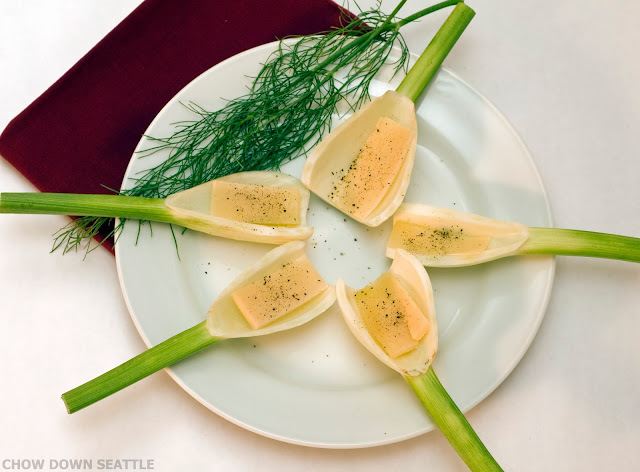 I found a recipe online from EatingWell.com for a delicious appetizer or snack using the fresh Fennel. I cut most of the stalk off the Fennel and trimmed part of the bulb. I then added some extra virgin olive oil, a thin slice of fresh parmesan cheese, and some fresh ground pepper. These were very tasty and they didn't last long after I took the photo of them! Another vegetable that I have not worked with personally is the Pattypan Squash. 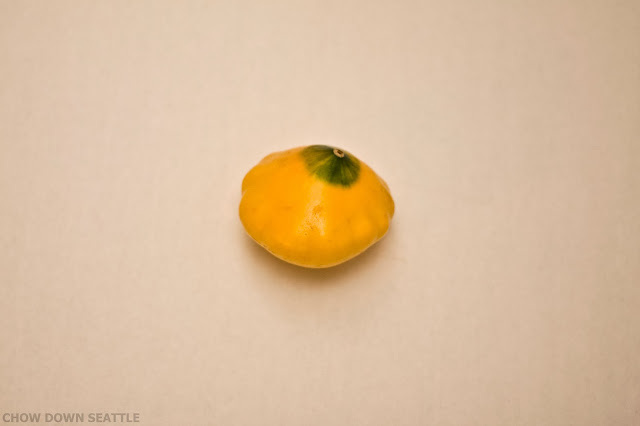 Which is a UFO-shaped squash. I found a recipe online posted to MyRecipes.com that was taken from Cooking Light. This was a pretty easy recipe. 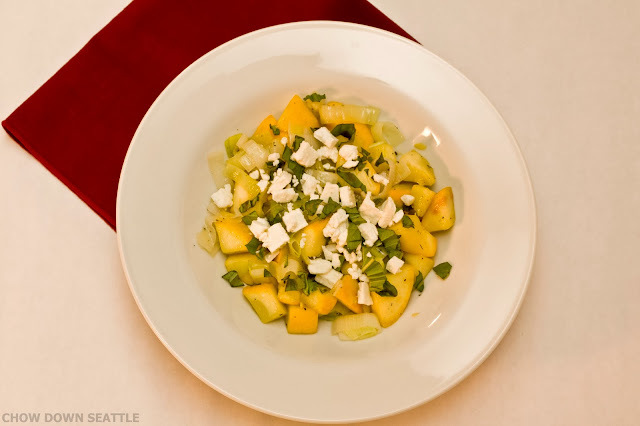 I chopped the Pattypan Squash into small cubes and also chopped up a Leek. I then sautéed the squash and leek in some extra virgin olive oil for about five minutes. I then plated the sautéed vegetables and added some fresh chopped Basil and some Feta Cheese. This dish actually surprised me. The flavors all worked very well together, and I have now found a new side-dish to add to my dinners! Next is the Acorn Squash. 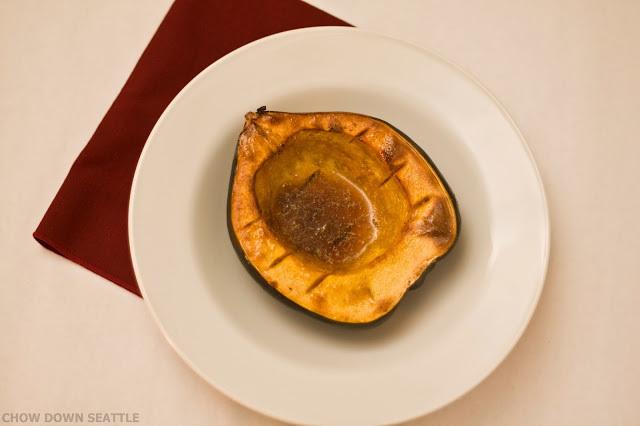 One of my favorite ways to prepare an Acorn Squash is to bake it. I found a good recipe at SimplyRecipes.com. 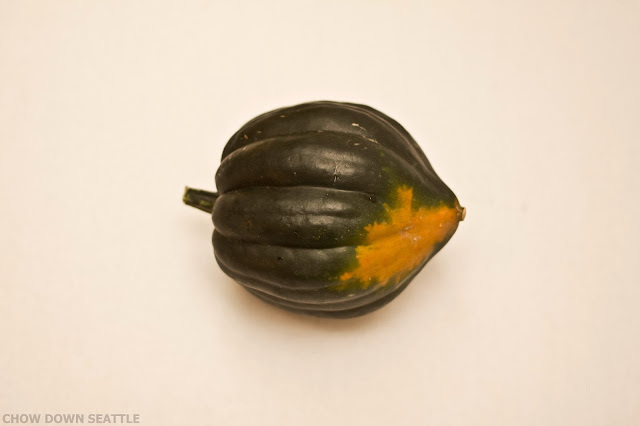 For this recipe, I cut the Acorn Squash in half and scooped out the seeds. I then cut slits into the squash. I added some butter, brown sugar and real maple syrup to the squash. I then baked it for one hour. To me this dish is more like a dessert than a side-dish. I have to confess that I did eat both halves of the Acorn Squash after I took this photo. I'm not going to let this delicious food go to waste! 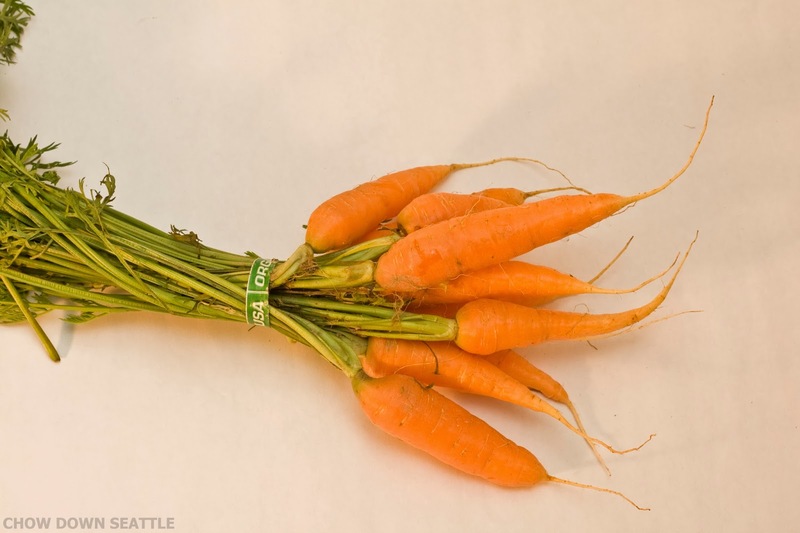 As for the carrots, well, I just ate them raw as a healthy snack. I just love the taste and flavor of fresh-from-the-farm carrots! As for the remaining veggies (Chard, Potatoes & Zucchini), I roasted the potatoes and zucchini together in the oven with some olive oil, salt and pepper, and I added the Chard to another red leaf salad. 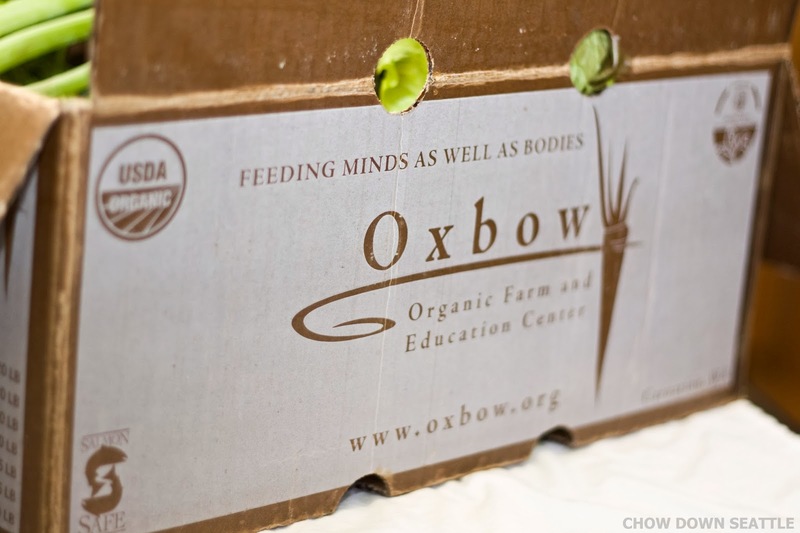 I want to thank Oxbow Farm for giving me the opportunity to take part in their Oxbow Box Project! I had a lot of fun preparing these foods with their fresh and delicious vegetables! If you have been thinking of possibly joining a CSA program and want to take part in receiving fresh, local, organic and sustainable produce, then please do check out Oxbow Farm website for more information of their program, and all the great work that they do on their farm.